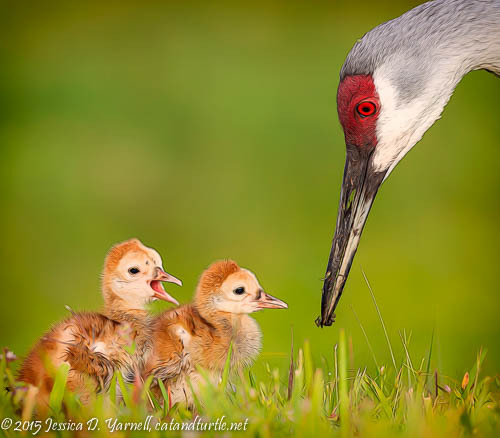 A few days ago I came across my Sandhill Crane family from last year (the colt that I saw hatch). I stopped seeing the family regularly when the surviving colt was about three weeks old. Now it’s almost a year later, and the colt is full grown. You can’t really even tell which bird is the baby anymore. I know it’s the same family because I see these birds so regularly each year. Pretty soon the adults will kick last year’s baby out and start making this year’s nest. Seeing the family made me pull out last year’s photos. Then I got inspired to try Topaz Glow, a computer program that’s like Fractalius (but it runs on my Mac!) After playing with the trial version, I think I’ll be buying the full version. It’s fun!! 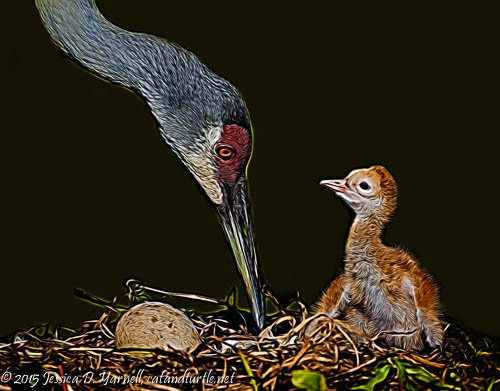 Mama Crane sat patiently on her nest for a whole month. Last year she actually nested twice. After laying her first eggs in early March, a gigantic rainstorm flooded the nest and the eggs didn’t survive. She tried again a week or two later. I watched every day as she waited and waited. 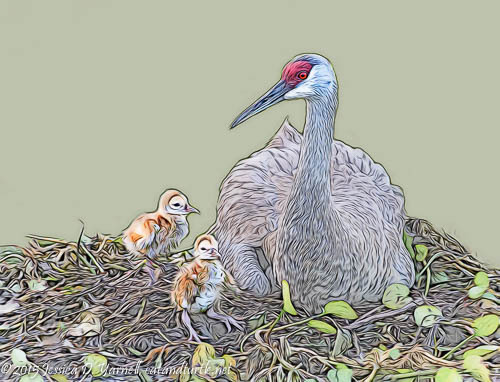 One of the “Brilliant on White” presets (with some tweaks) was perfect to dress up this image of Mom on her nest. Finally one afternoon there was a tiny colt at the nest, and a small hole in the other egg. The little chick was so cute! It was so special to get to photograph the mom, baby, and baby-to-be. The original photo had a really cluttered background, and I loved how I could use Topaz Glow to darken the background to make the subjects pop. On their first full day in the world, the two colts returned to their nest after many long hours of trotting after Mom and Dad in the grass. Mom settled down on the nest, but the grass-seed-covered colts were too busy fighting to settle down. 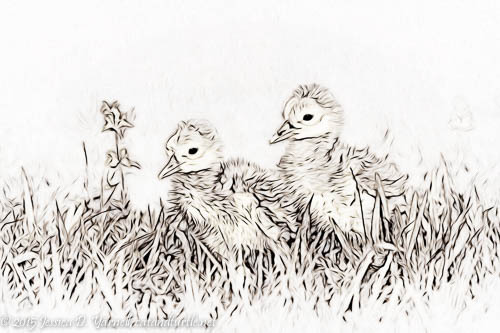 The lighter tones and pen-and-ink feel of this Topaz Glow effect seemed right for this little family. The next morning, it was time for breakfast and bugs. This was one of the “Fur and Feathers” presets in Topaz Glow. It’s great for a well-saturated and slightly painterly feel. Then my little explorers took a little walk in the grass that was as tall as they were. While I loved the tones in the original image, I was curious to try a black and white version. I really liked how Topaz Glow helped me pull out the outlines of the birds. 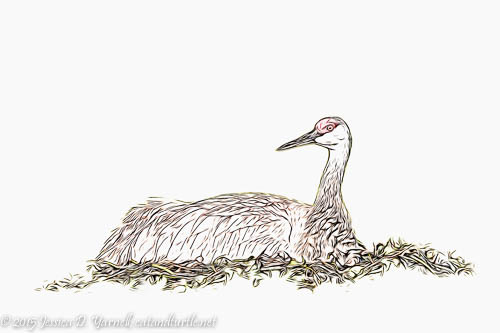 It reminded me of some of the illustrations in the Sandhill Crane book my parents got me. The last photo is “my” tiny colt on his second morning. This is more of a traditional Fractalius glow. It was perfect for the little bundle of feathers and energy!